Just hearing from you makes me smile! And you certainly look geared up for the job! Very nice of you to take on that task! Oh, Sammy, you silly boy! You always make me smile!! Happy Saturday… and ‘BE CAREFUL IN THERE’!! Hi Sundae! I know – I’m kinda silly sometimes aren’t I ?? I wanted to make everybody start their weekend off with a big old smile….it worked didn’t it?! Can I borrow your hazard suit when I clean BJ’s pan? Guess I’ll have to get my own since you’ll be using yours!! Hi Miss June……HAHAHA! Well, I don’t ALWAYS need my hazardous waste suit to tackle this job but this morning it came in quite handy – if you get my drift – ! Hi Sammy, my mom messed up my saturday also with house cleaning. But if you walking on moon , is the moon really made of cheese? Hi Easy! I’ve not been to the moon (yet) but I bet it’s made of cheese. If it is, I bet there’s lots of mousies living there…..which means I’d be having a blast up there since I’m a cat right? UUUH Sammy my mom don’t weared her glasses and thought you were a cosmonaut…. how embarrassing OOOAH MOM! SOOORRY! HAHAHA! 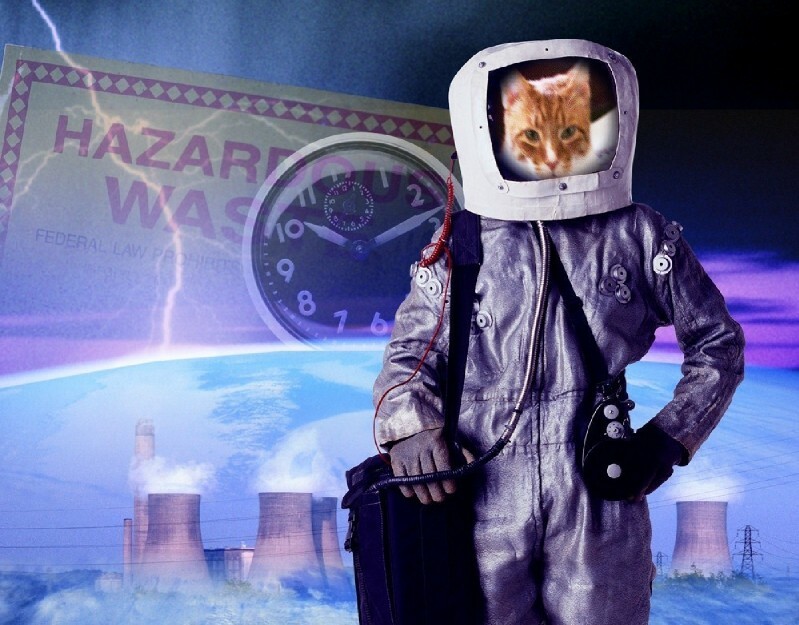 Your Mom’s not the only one who thought I was in an astronaut uniform but I’m wearing the Hazmat suit because cleaning litter boxes can be a bit – well – FRAGRANT if you get my drift (haha). Hi Goose!!! I’ve seen you “around” but haven’t had a chance to visit you yet – thanks for stopping by – so you like my Hazmat suit huh? Believe me – there are SOME DAYS (wink) that it will be coming in VERY handy! Hi Cody my friend! Happy Gotcha Day….I hope you got some extra special treats for the occasion? You know, I DO have thumbs since I’m a polydactyl and that’s why it’s so EASY for me to do the litter box thing (as long as I’m wearing my protective gear of course!!). Have a special nice day……and give your Mommy an extra hug from my Mommy OK? You are so funny, Sammy! I owned two cats who were trained to use the toilet. They even flushed it. Some of my house guests were startled to see a cat using the bathroom and they said they’d never had to wait for the cat to finish before they went in! Hi Miss Trish! I’ve heard of cats who used the toilet but not in a long time. That’s pretty funny though that humans had to wait for the cats to finish flushing before they could use the toilet….that’s the ultimate “turn about” I’d say!! Well I try to have cattitude….that’s for sure….!! Hi Nerissa! Well, I do have an astronaut suit as you may remember – I’m a guy of many talents (and many suits). My FAVORITE suit is this red and white striped number that fits me PURRRRRRRRRRfectly though. A hazmat suit! me needs one of those to use the litter box AFTER Kozmo uses it! Thank Cod, me has trained Mommy to empty it often (see says she can’t stand the smell). Hi Nellie! Maybe you and your Mom could share the Hazmat suit – she could use it first to clean the litter box after Kozmo messes it up then you could put it on just in case there’s – well – you know – leftovers!!! MOL You’re so funny Sammy! Hi Texas…..yes it is dangerous – well – sometimes anyway! I’m very good about my litter box though – before I decided to take on the responsibility of cleaning it out MYSELF, whenever I’d use my box I’d run tell Mom right away so she’d clean it out for me IMMEDIATELY (screaming at her gets the message across quite nicely I’ve noticed!). Now I can just put on the suit and take care of it myself. hee hee! Mommy has a SCBA suit…now she’s getting ideas! Silly cat. Hope your Saturday was lovely and your Sunday is even better! Hi Miss Dee!!!! Happy Sunday……..my parents are leaving me alone this morning so I’ll have the house to myself – that means PEACE AND QUIET and naps galore! YAY! Hi Savannah! Well, that Hazmat suit is Sammy-size instead of Mommy-size so I figure I’ll just keep up the litterbox duty – besides, she does SO MUCH for me, it’s the LEAST I can do to take care of this little duty!! !